January 15, 2018 - Bell Incorporated installed a PPCTS DGM SMARTFOLD 1100SL ULTRA X Folder Gluer for folding carton at their new Groveport Ohio facility. 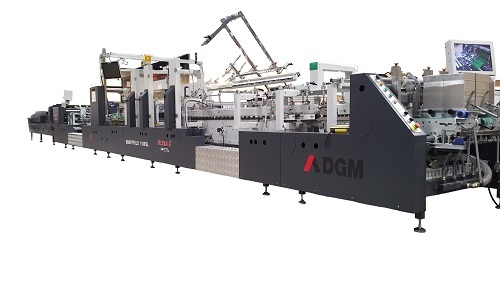 The SMARTFOLD 1100SL ULTRA X was put into production last July 2017 in a 24/7 production environment and has already produced several millions cartons. The SMARTFOLD ULTRA X has given Bell the ability of high speed folding and gluing production combined with fast job changeover. The SMARTFOLD 1100SL ULTRA X includes motorized job/memory recall carriers for fast job changeover, an extra length pre-folding section with tilting upper carrier frame, an extra length "universal crash-lock multi-function section" with integrated "bump & turn" and carton aligner, left & right 6 corner folding, as well as an extra length final folding section with drop down lower and lifting upper center carriers. The SMARTFOLD 1100SL ULTRA X is powered with a multiple servo drive system for precise carton compression section shingle control through inching, production, acceleration and deceleration speed changes, as well as an innovative high speed servo back folding systems which allows minimal carton separation. The electrical/electronics design is based on non-proprietary technology for easy machine servicing and with remote diagnostics capabilities. The SMARTFOLD 1100SL ULTRA X is an affordable, cost effective, state of the art solution for the folding and gluing needs of today's converter and market demands.